A few weeks back I wrote a short essay on “How to Forge Adaptability in Police Leaders and Culture.” In the essay we discussed the Adaptive Leader Methodology (ALM) is a cultural change, and not a prescribed list of tests and exercises, or stringent lesson plans and schedules. The Adaptive leader Methodology builds on the core principles and values referred to as “ethos” (more on ethos in the original piece). These core principles are forged in “strength of character” and must be aligned with being able to decide under pressure with speed and maturity. In other words a cop must be able to make rapid decisions that are sound decisions. Adaptive leaders will also need a greater variety of skills and a wider breadth of knowledge to meet the adaptive challenges they confront, both in problem solving and in fighting crime. We must create and nurture in every cop, in the five key attributes of adaptability: An officer must be Intuitive; this enables rapid decision-making without conscious awareness or effort. Officers must be critical thinkers and possess the ability to achieve understanding, evaluates viewpoints, and solves problems while also being able to creatively think which is equally important. Often called fingerspitzenfuhl or fingertip feel. Otherwise known as tactical judgment, recognition primed decision making, “coup d’oeil” or intuitive decision making. It is important for cops to be self-aware and possess an understanding of one’s own strengths and weaknesses. This leads to highly refined social skills and cops with the ability, to assess people’s strengths and weaknesses, through interaction and the use of communication skills (verbal and non-verbal), and the art of listening which leads them to a more focused situational assessment and hence the ability to orient to the type of problem or challenge it is they are facing. 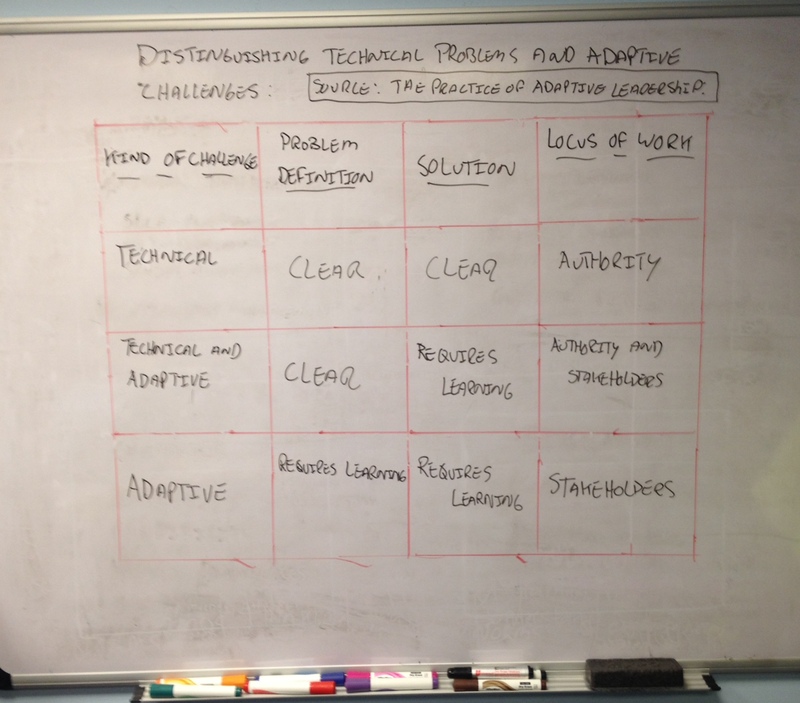 The diagram above, adapted from The Practice of Adaptive Leadership: Tools and Tactics for Changing Your Organization and the World, lays out some distinctions between technical problems and adaptive challenges. As the diagram implies, problems do not always come neatly packaged as either “technical” or “adaptive.” When you take on a new challenge, it does not arrive with a big T or A stamped on it. Most problems come mixed, with the technical and adaptive elements intertwined. We must be able to assess the type of challenge (encounter) we face. Here’s a cop example: You respond to a minor motor vehicle accident involving and 85 year old woman who crashed into her neighbor’s car parked legally on the street as she backed out of her driveway. Once you arrive and begin to investigate you observe dents and scrapes on her car. Initially you make the determination that this is your “typical accident” you gather all the relevant information to file the accident report, write the appropriate citation and determine that the car should be towed to the body shop for repairs. In that sense, this situation has technical elements: who’s at fault can be determined in court or through the insurance companies; the scrapes and dents can be solved by the application of the authoritative expertise found at the body shop. The adaptive challenge presents itself as you look closer at the car involved and notice numerous older dents and scrapes. The neighbor tells you that the 85 year old driver has trouble with her vision and has banged into her own garage doors from time to time. You do a more comprehensive investigation, including making observations of the garage and observe more damage and paint colors match the elderly woman’s car leading you to believe the information the neighbor(s) has provided is credible. As a result of the investigation you make the decision to file for an “immediate threat license suspension.” You let the 85 year old know her car will be towed to the repair shop and she agrees that it should be. You then tell her you are concerned with her vision problems and her ability to drive, safely. As the 85 year old hears this message and realizes that this will affect her ability to drive. In affect her freedom is jeopardized to come and go as she has done throughout her life, is where the adaptive challenges manifest more fully. The adaptive part can been found in the loss this change would represent, a loss of an important part of who she is a person who still drives. This would have a profound effect on her emotional state and take away her freedom and independence. An officer looking at this example solely as a technical problem would gather the information and document the accident, issue appropriate citations and tow the car to be fixed, but it would not get at the underlying adaptive challenge: This would require contacting relative, friends or elderly services in an effort to help the 85 year old in adapting an new identity (one who can no longer drive) and finding others ways to thrive on her own terms, with the help of others. The above is a simple example. Technical problems and adaptive challenges manifest themselves in all sorts of problems from this simple car accident to a major crisis. The point is, to solve problems effectively you must be able to distinguish technical problems from adaptive challenges and where they intersect and divide. This allows you to develop courses of action that fit the situation, as the situation presents itself in real time. To forge adaptability and distinguish between technical problems and adaptive challenges, requires constant situational assessments and taking problems solving beyond authoritative management, you risk telling people what they need to hear verses what they want to hear, but you can help your police department continually improve becoming more effective in dealing with its most difficult challenges.